I don't have long until Jack starts full time school in September so have been making the most of our afternoons together when it is just us two (follow us on instagram for daily photos of what we've been up to). One of our favourite things to do is to visit our local garden centre. We could honestly spend hours looking at all of the flowers, water features and fish in the ponds. Most garden centres have lovely little cafes too and little play parks outside which are always a hit and a lovely inexpensive way to spend the afternoon together I think. During our visit last week, Jack decided he would like to plant some flowers at home. I took one look at the bags of compost piled high and decided I wasn't going to struggle trying to carry a big bag to the car and supervise an energetic four year old at the same time! We settled on buying some mixed flower seeds and once we were home I popped onto compostdirect.com to order a big bag of compost which would be delivered direct to our door which certainly saved my back! Our compost arrived three days later and that evening we all got involved in planting Jack's flowers. 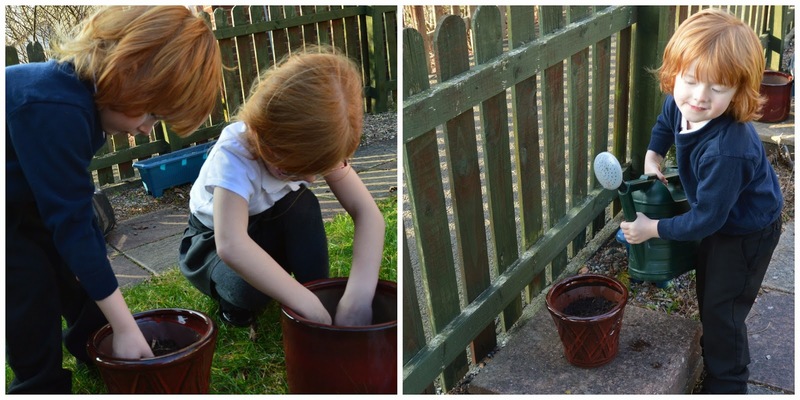 We downloaded and printed these 'gardening rules' from Twinkl before getting started and I have to say it was nice to see the children getting on, working together and doing as they are told for once! I am hoping Jack's flowers are going to grow into something beautiful like the ones I couldn't resist photographing during our trip to Wallington Hall earlier this year. Watch this space for the results! Do you visit garden centres with your children and have you involved your children in your garden at home? I'd love to hear your experiences. I'm OBSESSED with Garden Centres! Unfortunately Simon doesn't really get it but I'm hoping to one day convince him how great they are, I can spend all day in them. There's an AMAZING one near his Mum's house in Leigh, it's massive and has a fantastic tea room that serves huge cakes - it's always my priority when we go to Manchester! Ah they are fab - I am lucky that Steve quite likes them too - we are like little OAP's LOL! I love visiting Garden centres too. Looking out for the first is what I used to do too as a child. It's great fun. A bit like being in a jungle. Hope you flowers grow into something beautiful. Oh yes I guess it is like a jungle to little ones isn't it?